As of this writing, we have Bootstrap 4 with an alpha version which is an incomplete release and not suitable for production. With this version there are major changes in store. Lots of new features are added and customization options will be available. Although there might be some argument about which is the best CSS framework to use, almost every designer can build pretty much anything with Bootstrap, and critics could too if they took a little time to reconfigure default Bootstrap styling. FREE: Bootstrap is open source. There’s no need to pull out your credit card. Powerful Grid System: Bootstrap has the best responsive, mobile first grid system available. It’s easy to use and flexibility that allows you to produce prototype layouts and make customization easy. Excellent documentation: Bootstrap has exceptional documentation which can help you understand any part of the framework whether you are a beginner or pro. As a designer, it is worth studying the news features and updates. To design websites for Bootstrap you might think differently, but I don’t think it’s a waste of time to know and understand the things you need to consider when designing Bootstrap-based websites. Bootstrap 4 comes with five major colors inside. These colors comes with their respective classes and prefixes which can be re-used across different components such as buttons, links and alerts. Check out the image below. Note: In Bootstrap 3, the “btn-secondary” class is the “default” class. In Bootstrap versions 1-3, grids are measured via pixels. 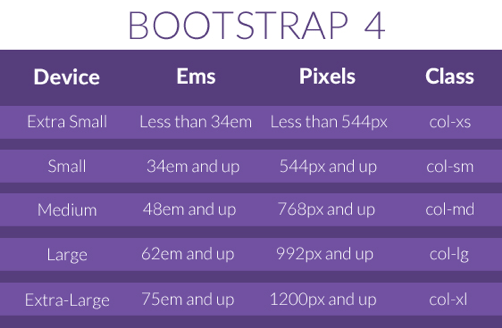 However, in Bootstrap 4, grids are measured via ems and rems. So if you are working on a Photoshop layout design of a website it’s quite helpful if you are going to see what the equivalent measurement of ems to pixel. Bootstrap usually comes with 30 width gutter, 15px on each side of a column. This means padding left and right for column will be 15px each side, where as margin left and margin right for row is 15px. That gives you an idea how you will put spaces on each columns on your designs. One good thing about Bootstrap 4 is that allows you customize and compile your own build based on your needs. This includes color, container sizes and gutter padding. Often you want to select the column and remove the padding with CSS. You can create your own utility class helper to attain this quickly. Check out the sample code below. The hardest and most tricky thing about using Bootstrap 3 is the navbar. It’s tough to figure out because you need to add a lot of classes just to create it. Moreover, you also need to go to your CSS to customize the colors and some styles. 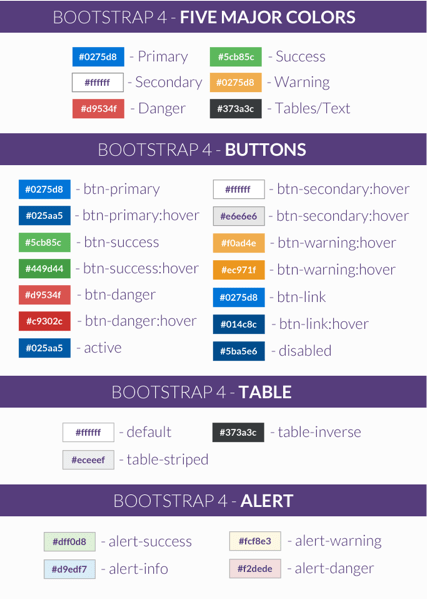 In Bootstrap 4, there are a lot of classes that were removed and more options to color schemes are added. This gives more options to control the layout of the website’s navigation. You can check the documentation here if you want to learn more. Bootstrap 4 enables users to use the CSS3’s Flexbox Layout mode. Flexbox is a layout mode that offers arrangement of elements on a page for responsive purpose. It provides a flexible container can expands or shrinks the elements size on different viewports. While this is a great thing about designers trying to make their design responsive, this will only work on browsers higher than Internet Explorer 9. Bootstrap 3 used LESS as its main CSS pre-processor, but due its popular front-end developers contributor it has switch to SASS via Libsass Sass Complier written in C/C++ Bootstrap 4. Now you can customize styles such as color, spacing, link styles, typography, tables, grid breakpoints and containers via _variables.scss file. Although Bootstrap is only one of many available frameworks for creating responsive, mobile-first websites, it offers a lot of possibilities for designers. Knowing about updates and new components will make these builds that much easier. We hope you’ve enjoyed reading this article. Sign up for our newsletter to receive regular updates and some cool stuff in your email. Hello and thanks for the article ! Do you confirm html changes with “col-..” to “span.” Big changes if it’s ok..
Bootstrap ditched ‘span’ after bootstrap2. Hi, are anyone of you are using bootstrap 4 or still you are continuing with bootstrap 3? I’m still using Bootstrap 3 since Bootstap 4 is in alpha, and a lot of the classes are changing. I’d wait for a beta or release candidate before using it in a production app. i’m using bootstrap alpha-4, because it is so helpful in design for webpages. So, i am waiting for bootstrap 4 in beta or stable version.